Occupying the former General Post Office, The Fullerton Hotel is located in the centre of the CBD in Singapore next to Singapore River surrounded by office buildings. The nearest shopping mall is about 20 mins on foot, however Fullerton Hotel provides regular shuttle service to the nearby shopping malls. There is an MRT station about 3 mins walk from the hotel. 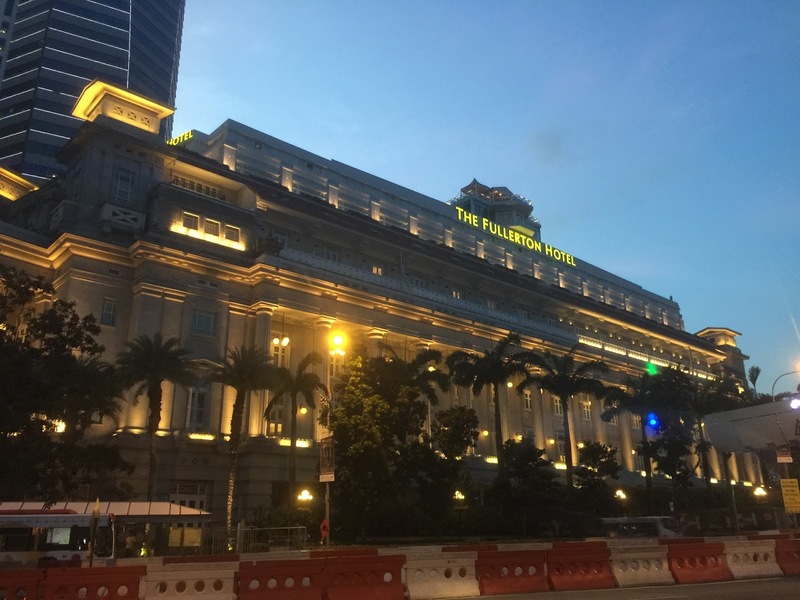 The Fullerton Hotel was accorded National Monument in 2015, staying here is like staying in a part of history of Singapore. 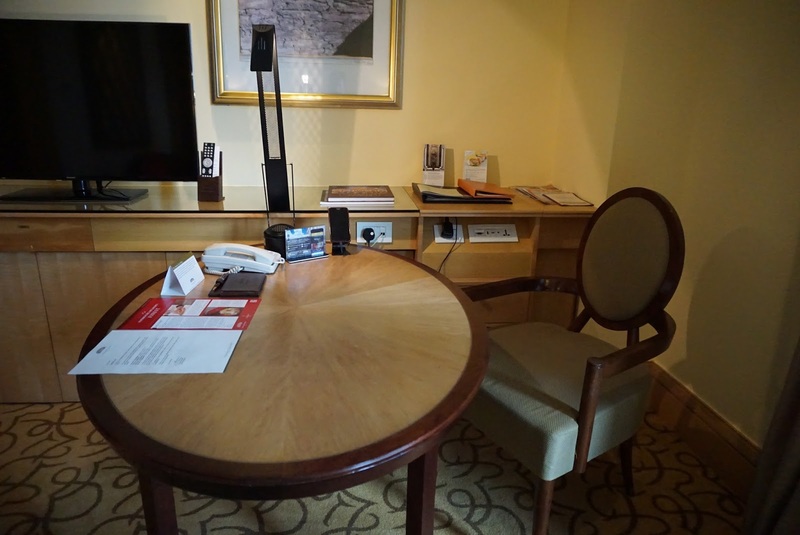 I checked into the Postmaster Room during my stay at The Fullerton Hotel. The earthy tones of light brown and beige colour running throughout the room eludes a cosy feel for guests entering the room. 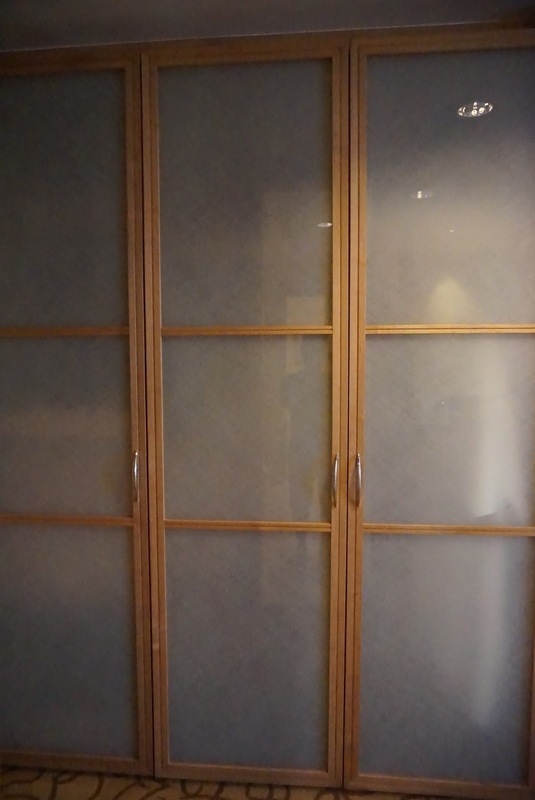 The three-panel wardrobe resembles a traditional Japanese door, with white panels and thin wooden trimmings. Although occupying but a small part of the room, the wardrobe is large enough for guests to put away one week worth of clothing. 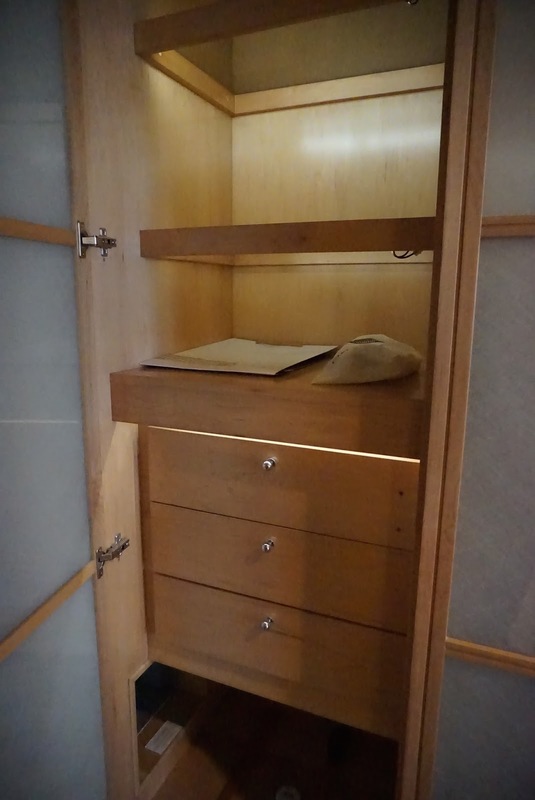 The panel immediately next to the main entrance has shelving and drawers, which gives ample space for guests to put away smaller pieces of clothing. 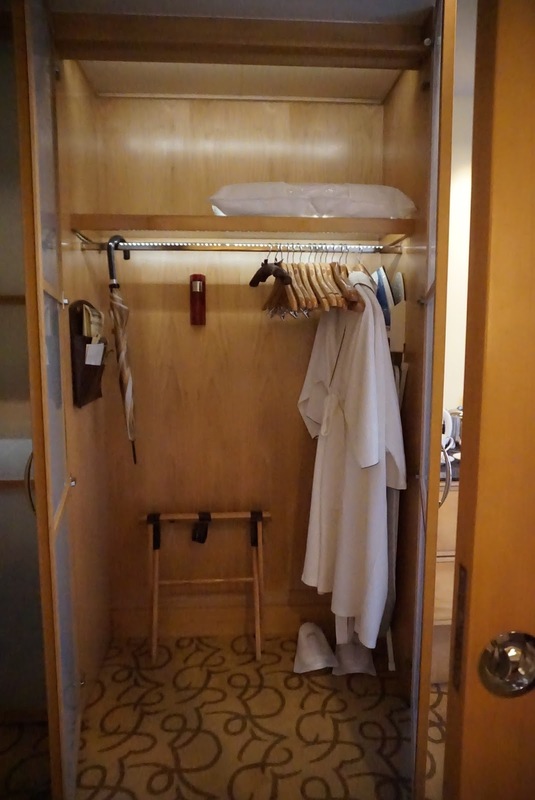 Guests can also hang up their cloths in the two-panel wardrobe next to it. A small foldable stool can be found inside this part of the wardrobe for guests to put their cabin-size luggage onto. I was able to put away my duffle bag on the stool and have the wardrobe doors closed. With the wall that makes up the bathroom opposite the wardrobe creates a small corridor that leads guests into the room. Stretching from the wardrobe through the entire depth of the room is hip height cabinet, using the same coloured wood as the wardrobe the hotel was able to achieve consistency in the colour scheme of the room. This makes the room look comfortable and not too confusion with the minimum use of colour schemes in the room. 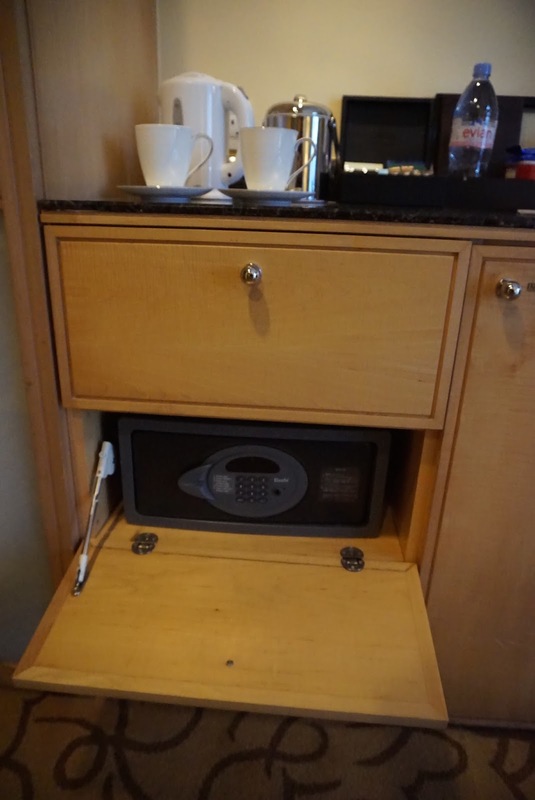 This cabinet houses the mini bar fridge as well as a safe nicely hidden away from sight. 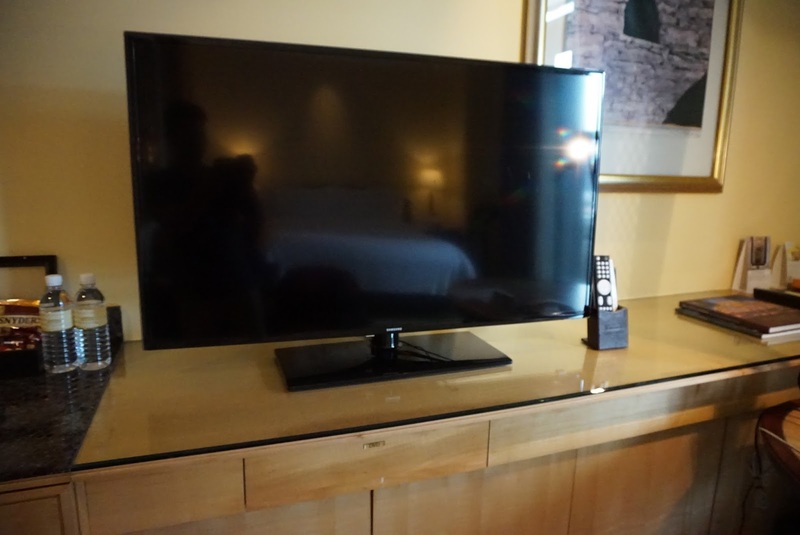 Right smack on the centre of the cabinet is the 42″ LED TV, which is placed directly opposite the King Bed. Facing the main entrance to the room, tucked away in a corner is where the workdesk is located. The workdesk is rather sizable and doubled up as a dinning table for me during my stay there. 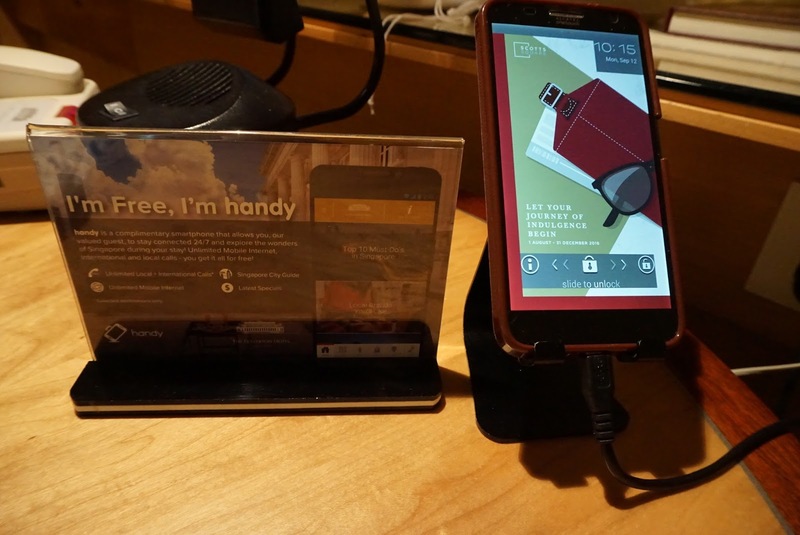 On the workdesk, the hotel provided a mobile phone which guests can use as a mobile wifi device. 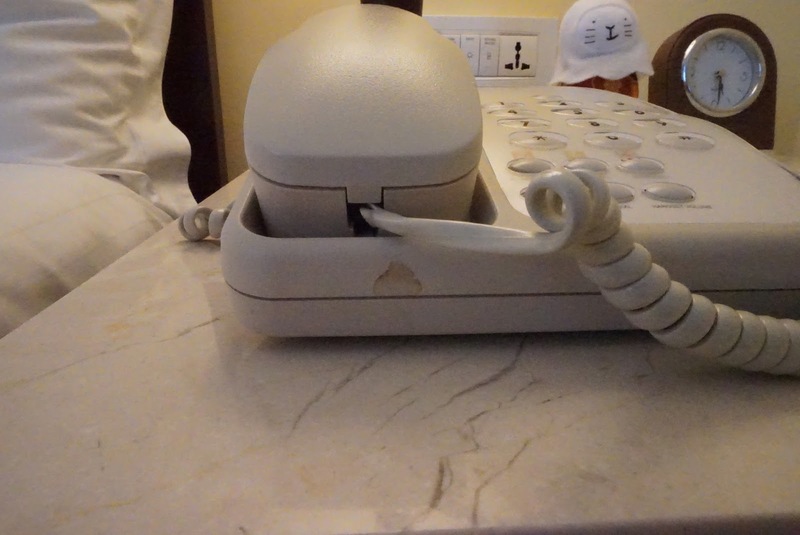 Local calls on this mobile phone is complementary from the hotel. There are also various media inputs located next to the workdesk for one to plug in their lifestyle devices to be projected from the TV. There are several options in the menu of this TV, including movies which are chargeable. Otherwise, guests can choose from the many local and international channels for entertainment. The King bed is placed opposite the LED TV. The large bed can sleep thee comfortably and the sleep quality of the bed is superb. 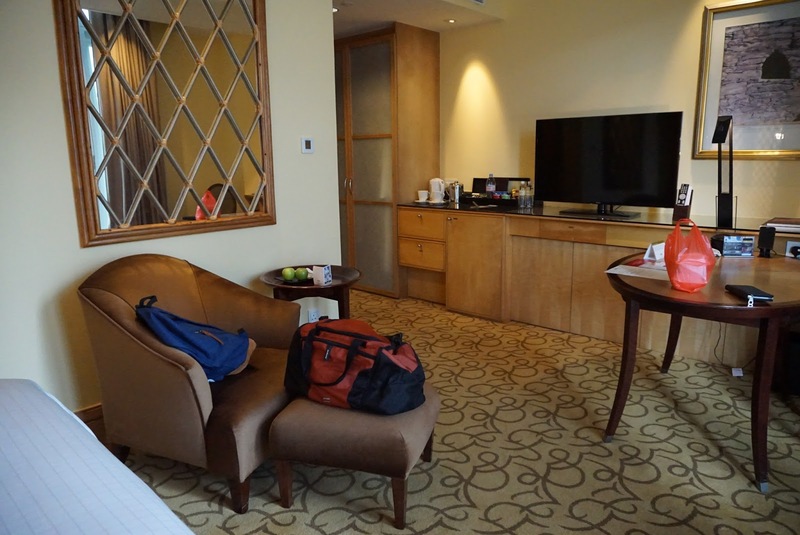 I had great rest on the bed throughout my stay at the Fullerton Hotel. 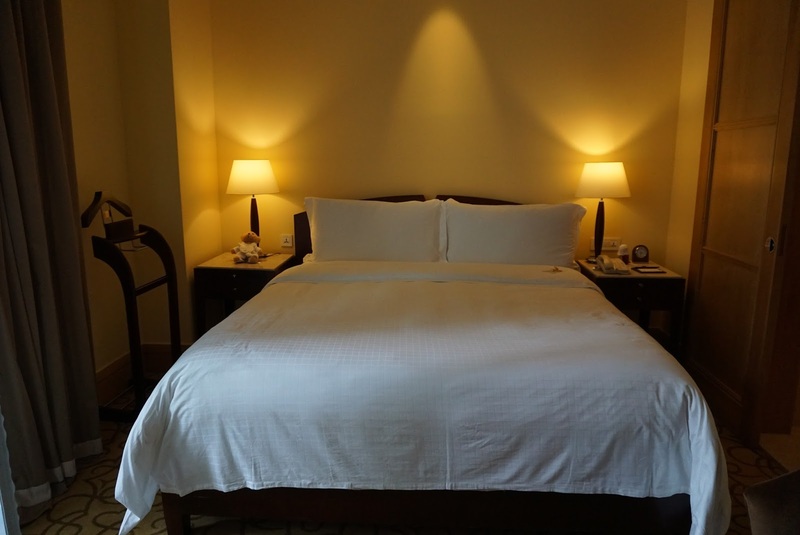 The pillows placed on the bed are soft, however Fullerton Hotel does provide a pillow menu with varying degrees of firmness to suit their guests. I opted for the buckwheat and firm feather pillow. As I prefer firmer pillows, I find the firm feather pillow to be more comfortable. 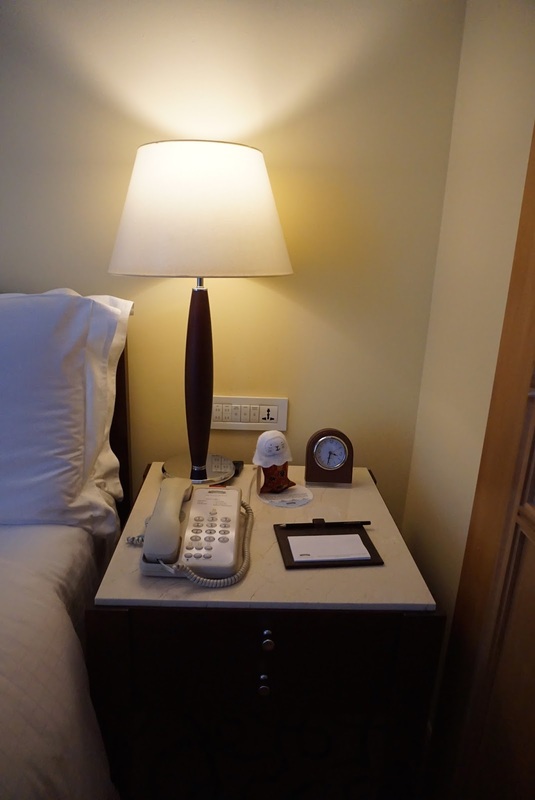 As with many international hotels, a couple of bedside tables are placed on either side of the bed. 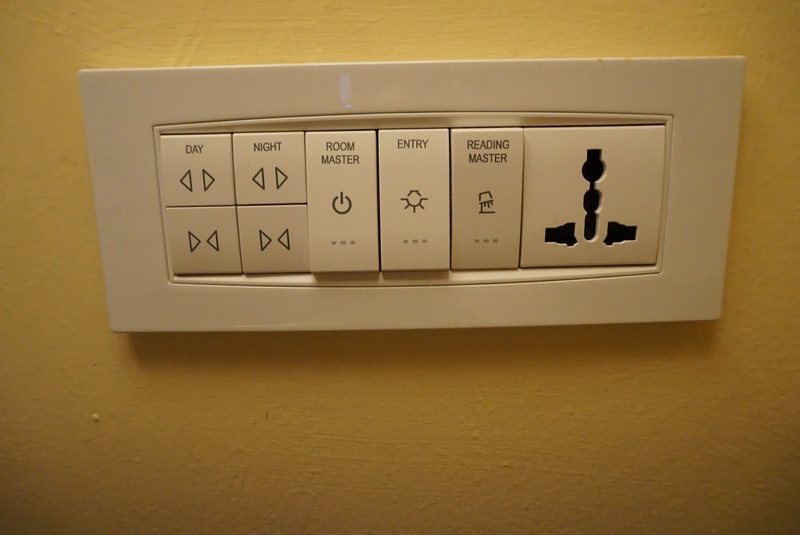 There is a master control on the right side of the bed which controls the lighting as well as curtains to the balcony. 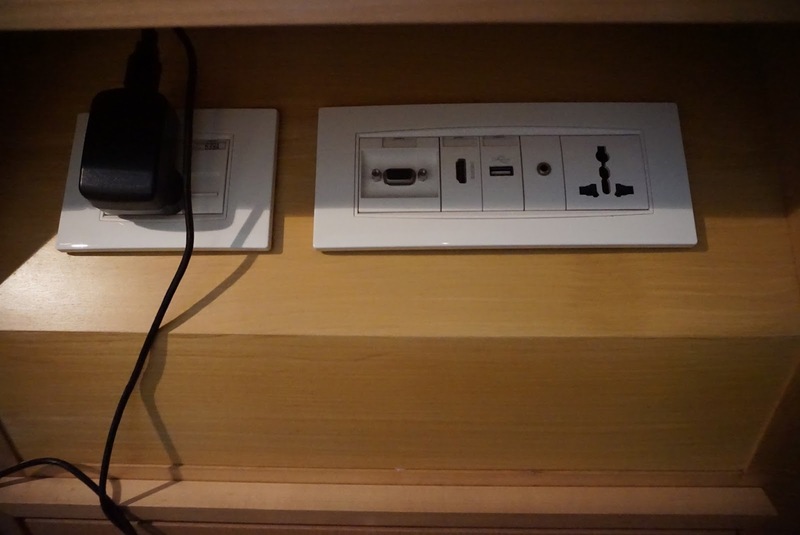 There are no lack of power outlets in the room, with two on either side of the bed. Placed slightly in front of the bed, tucked to the wall of the bathroom is a single seat armchair with foot rest. There is a small coffee table placed beside it. I find myself sitting on this armchair watching TV and reading a book whilst in the hotel. The armchair is rather comfortable to sit one. The placement of this armchair does not seem to come across as an obstruction for movement in the room. The main difference between the Courtyard room and the Postmaster Room is that the latter has an attached outdoor balcony. There are a few times of rooms in the hotel that comes with balcony. Furthest into the room is where one can find the door to the balcony. The balcony spans across the entire width of the room. 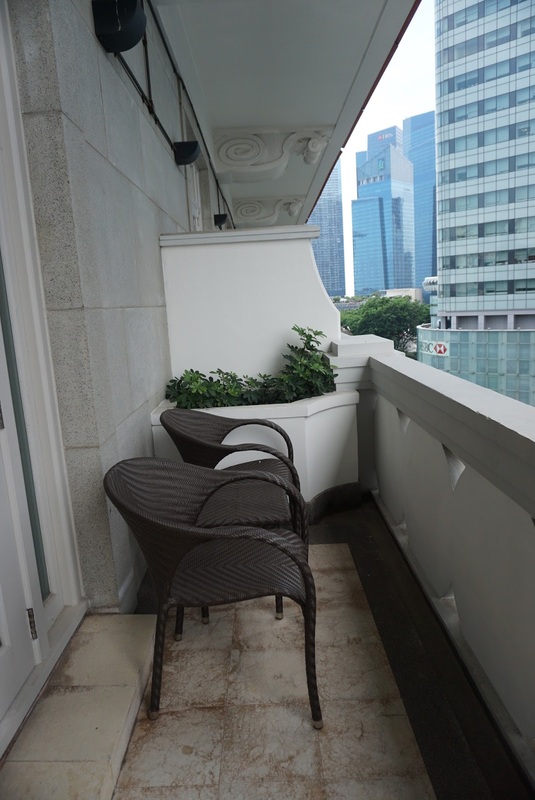 There are a couple of chairs and a table placed to one side of the balcony. Though the view (the room that I stayed in faced an office building) isn’t that great, I enjoyed relaxing by the balcony as it is rather windy. There is no direct sunlight onto the balcony, making it my favourite spot to hang out. There are two double paneled doors to the balcony. One would have to be careful with the outer door as it tend to slam back, thanks to the hydraulic door closer. Not too sure if the glass panel of this door will shutter with prolonged slamming of the door. 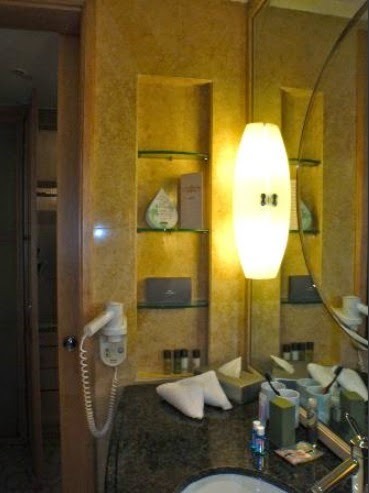 The bathroom is located opposite the wardrobe and next to the entrance. 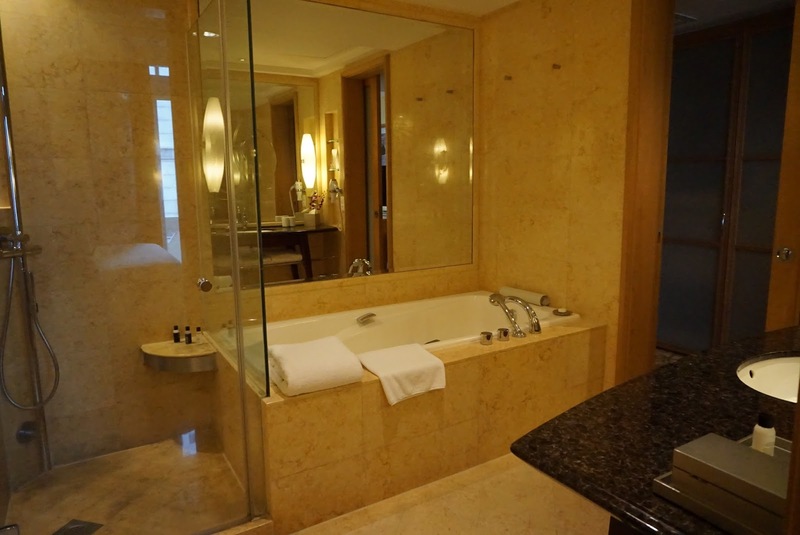 The marble laid bathroom is rather spacious. 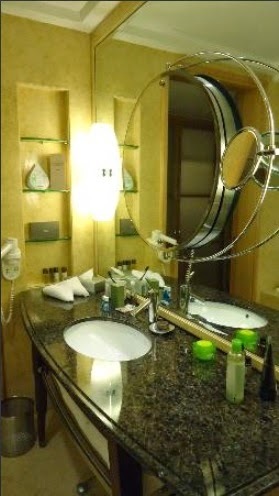 There are two entrances to the bathroom, one by the main entrance and another next to the King bed. 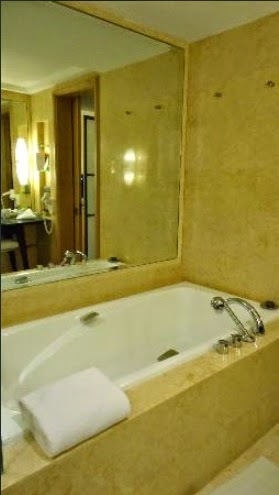 There is a large bathtub opposite the sink top, tucked in a corner of the bathroom. 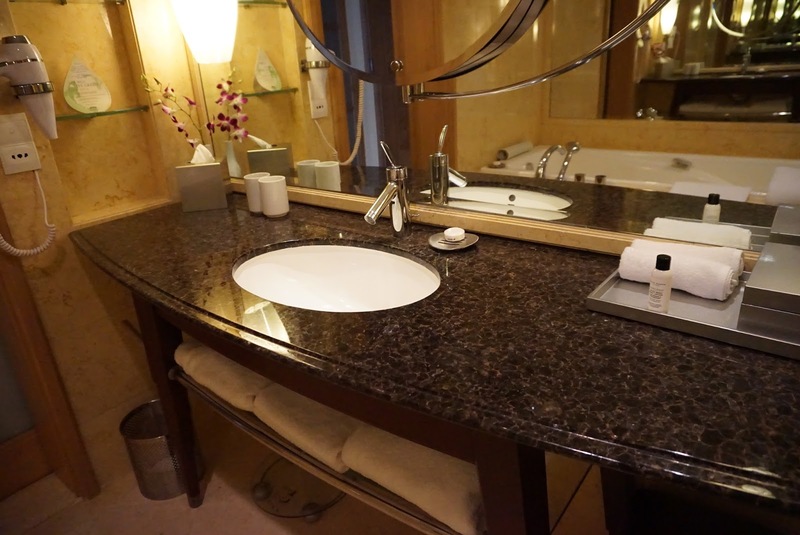 The sink top has ample space for guests to place their toiletries. There is a three-tiered shelf carved out of the wall that provided additional storage space. Next to the bathtub is a walk-in rain shower stall, enclosed by glass providing a wet and dry area. 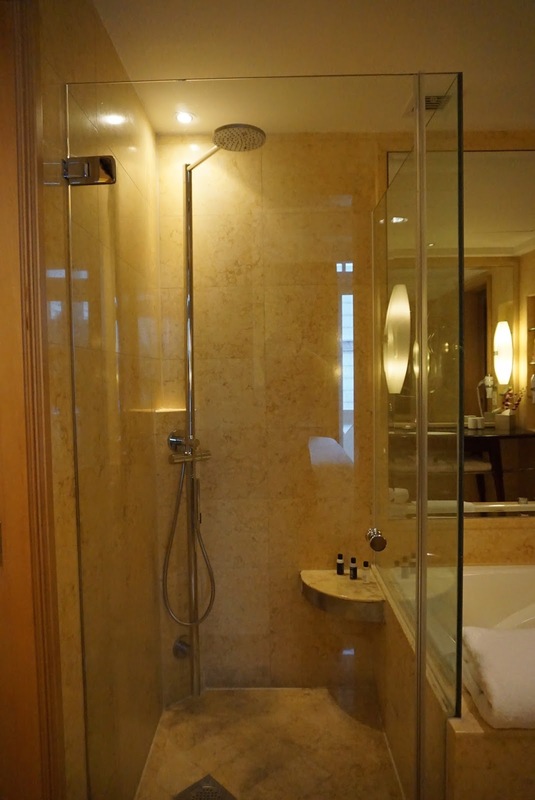 I like hotels that designed their bathrooms with a separate walk-in shower, which not just make showering easier (without the need to climb in and out of the bathtub for shower), it also separates the wet from the dry area. This means the wet flooring in the bathroom is kept to the minimum. Next to the shower is a toilet cubicle, which comes with an additional door. 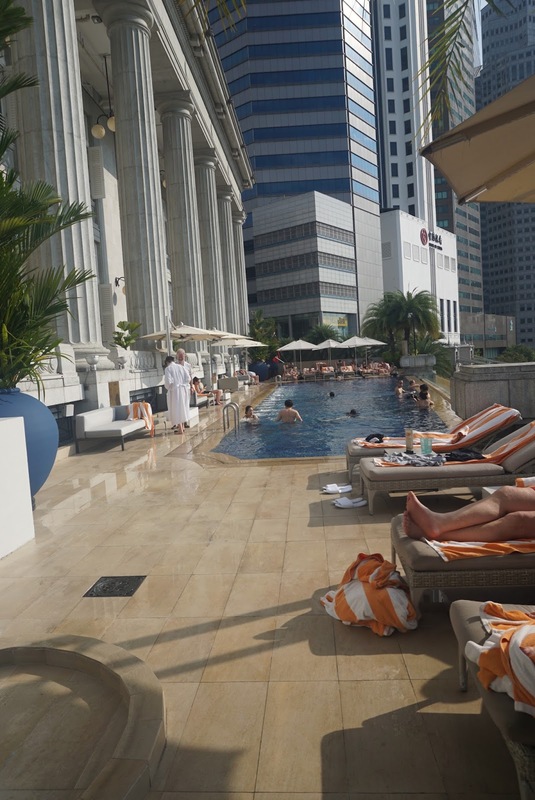 The swimming pool in The Fullerton Hotel is located on the 2nd floor. The 25m infinity pool, overlooking Singapore River, is rather small. There is a Jacuzzi area built in the pool. The number of sundeck chairs available are rather limited. On a busy day, one can forget about visiting the pool. 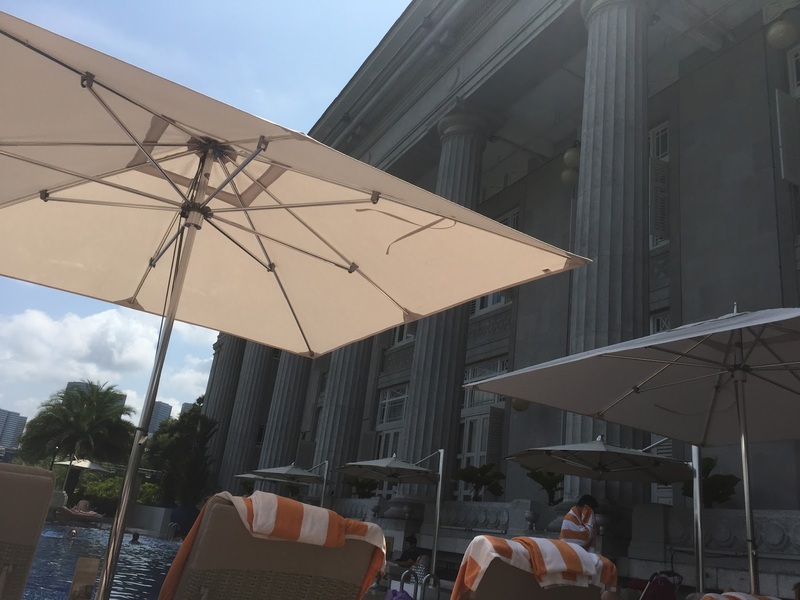 The Fullerton Hotel allows guests to use the pool at the adjacent sister hotel, Fullerton Bay Hotel. 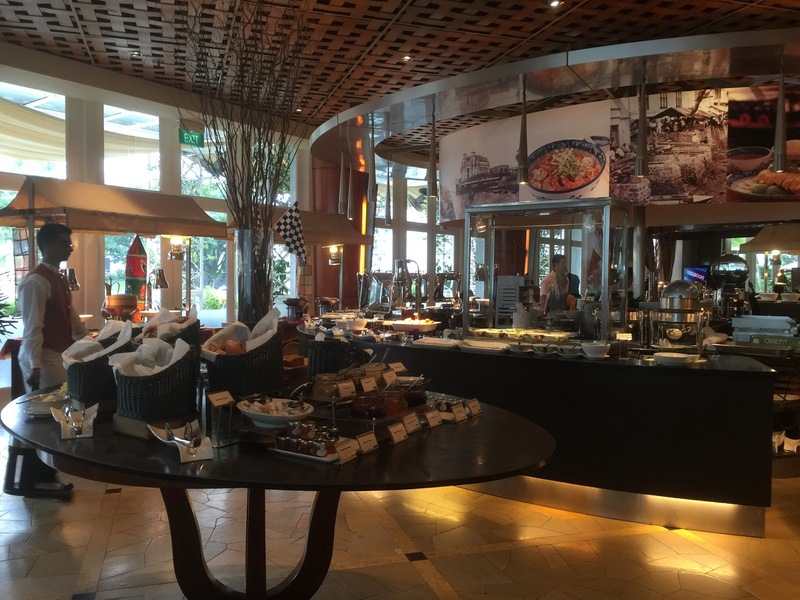 However one is expected to walk about 5 mins to Fullerton Bay Hotel. There is a bathroom next to the swimming pool, where lockers are available. 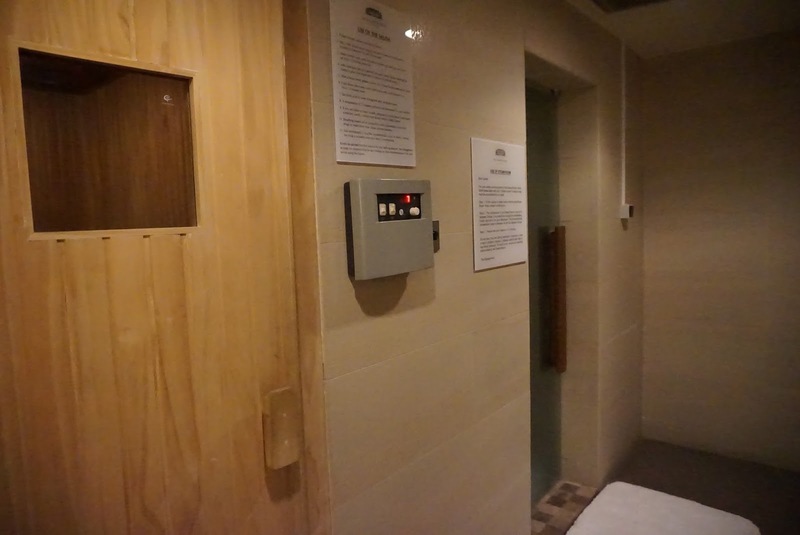 There is a sauna and a steam room inside the gents bathroom. 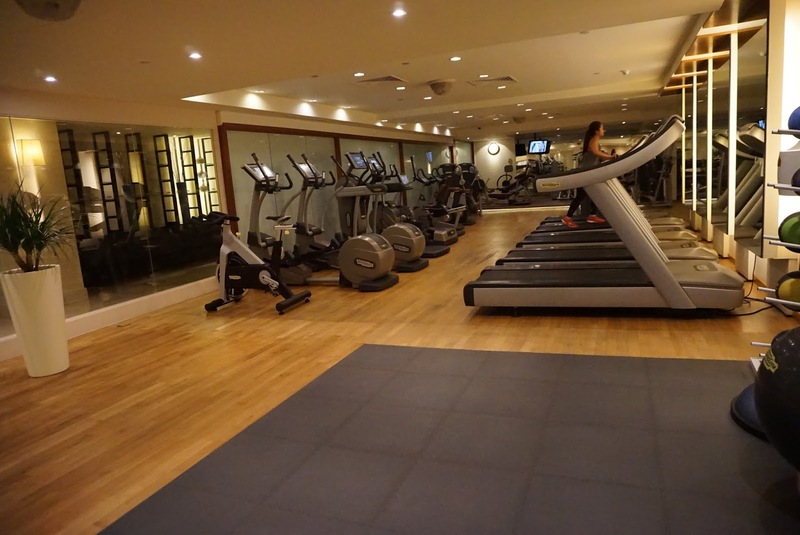 Gym in Fullerton Hotel is located at level 1M, opposite Fullerton Spa. The gym is rather small, however is well equipped with treadmills, static cycles as well as limited weights machine. Though not elaborate, one can still get a decent workout in the gym. 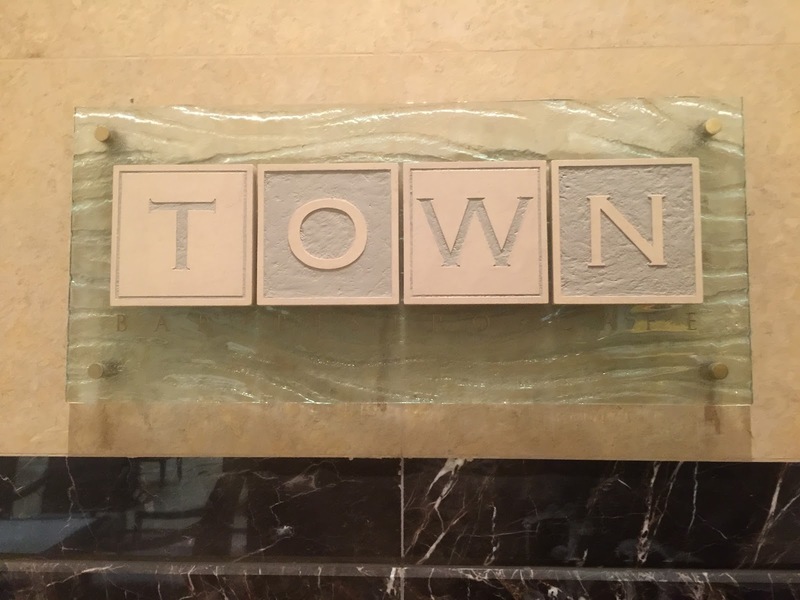 Breakfast is served at Town Restaurant located one the first floor of the hotel. There are no lack of variety served up at during breakfast. Other than the standard American and Continental Breakfast, there are also local fares being served up during breakfast. I find the providing of local fares to be a very good way of the hotel introducing local food to their guests. 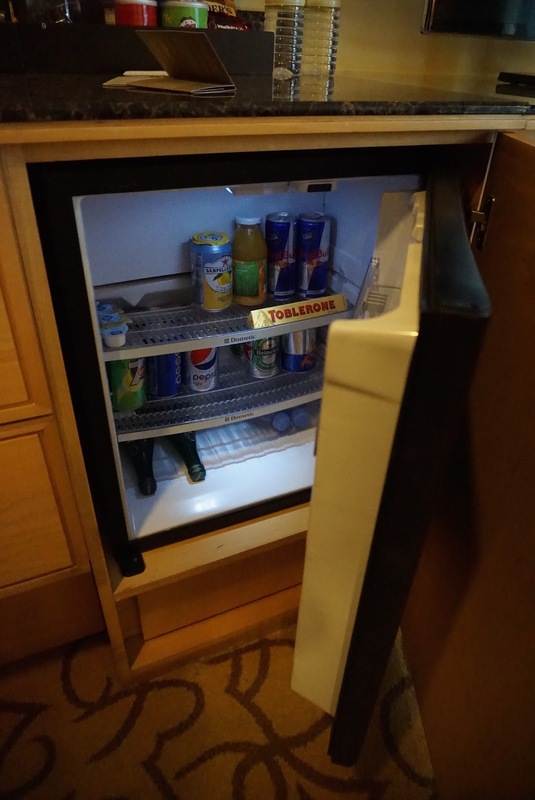 The service levels in the hotel is befitting of a five-star standards. As I arrived at the hotel during the check-in time of 3pm, there is a number of guests waiting to check-in. Staffs were seen coordinating with guests, assuring them that their turn to check-in will not take too long. I saw a pregnant lady in the queue, and thought that the staffs can do better by providing her a seat or place her in a priority queue. I did not have to wait too long to get myself checked in . However the check-in process is rather slow and took about 15 mins, excluding the wait time. 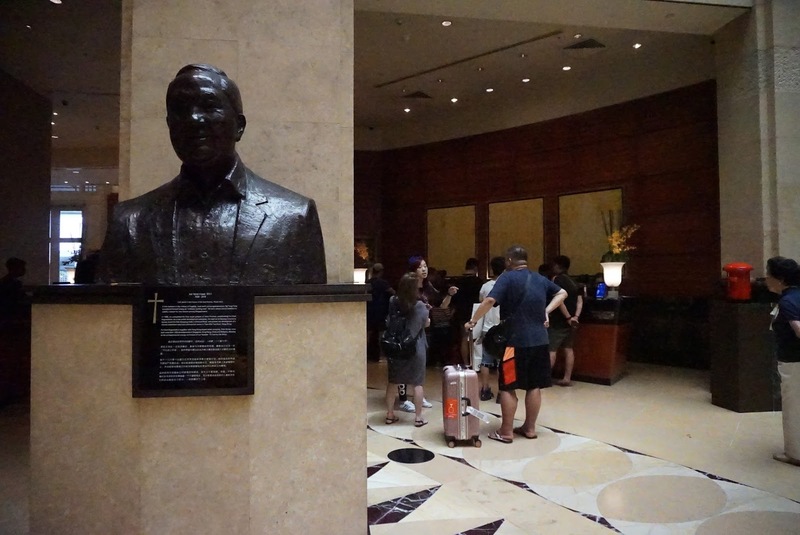 Other than the slow check-in process, the staffs around the hotel seem to be eager to do their best to ensure guests have a comfortable stay. 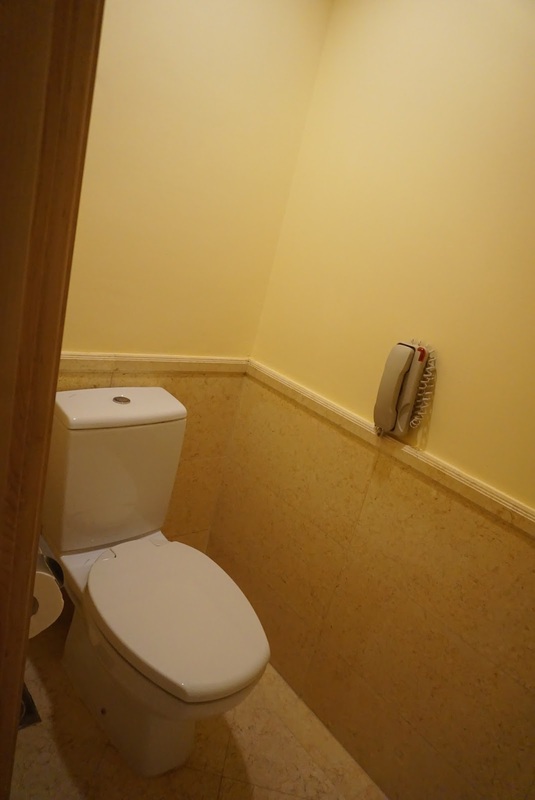 I called up reception several times to request for amenities and pillows. Whenever I called the reception for amenities or pillow, there will always be a call back to confirm that the stuffs that I requested for has been delivered. I find this check back is good way to ensuring guests get what they requested for. I ordered room service, before entering the room, the staff would introduced himself to me. I thought this is a good way of establishing rapport with the guests. The biggest star would have to be Izan, a staff working at the pool. He was welcoming when I hit the pools. Izan offered to bring us to the chair that we wanted and even took the initiative to lay out the towels on the chair for us. I seen Izan working hard to provide the same service to all other guests coming to the pool tirelessly, in the hot afternoon sun. He religiously removed towels that were left behind by guests, rearrange chairs to the way they were on top of helping guests to the sundeck chair. The staffs at Town Restaurant are very welcoming as well. I received greeting from a staff member before being led to my table and handed over their colleagues on the restaurant floor. 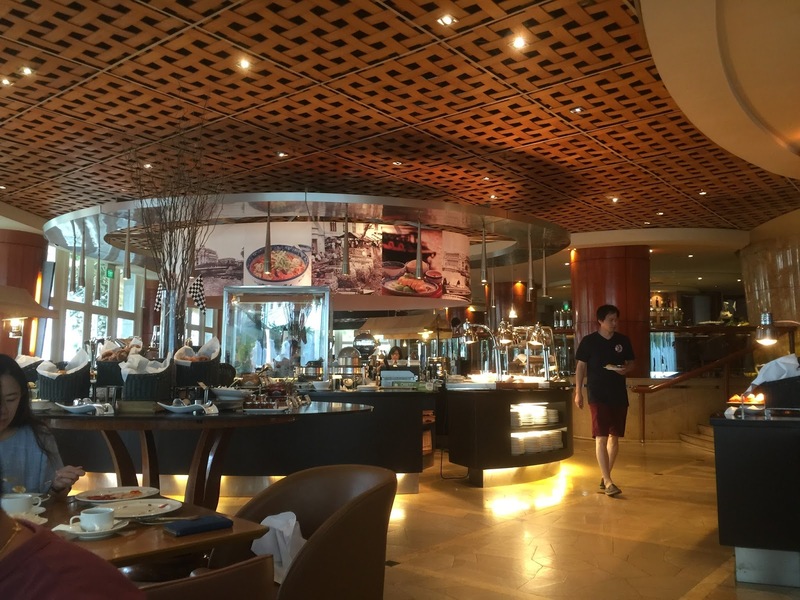 The staffs in the restaurants are very efficient and obliging to requests from guests. Coffees and teas came very fast, and no empty plates are left on the table. As soon as I returned to my table, the plates are already cleared. Staffs would pop by and check if I needed more coffee. 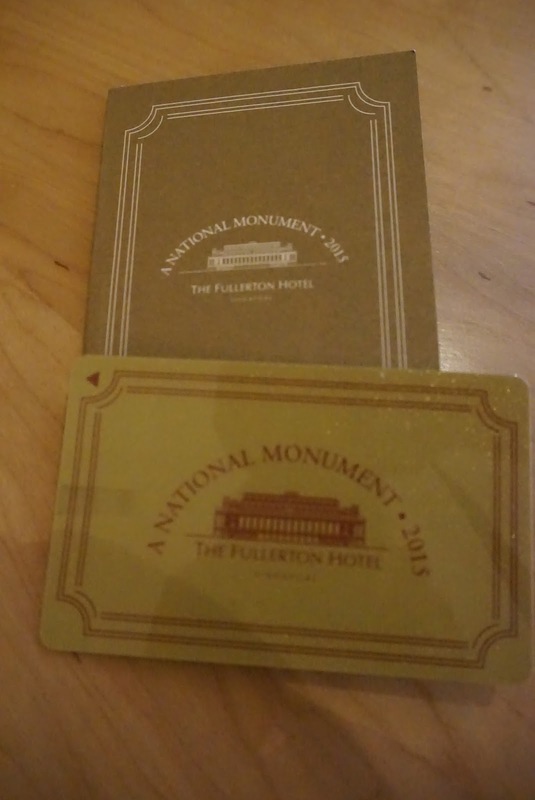 I had a comfortable stay in The Fullerton Hotel. 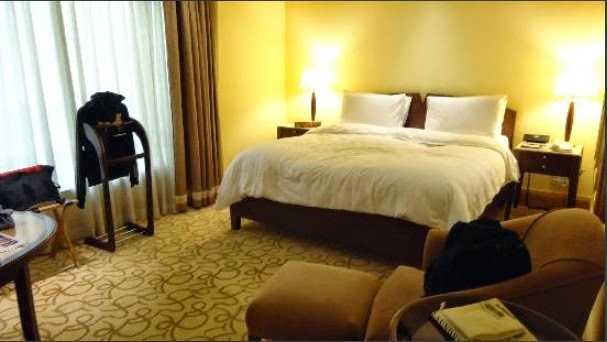 The sleep quality on the king bed was superb, the size of the room is just nice. I particularly like the balcony and find it a great place to hang out. In terms of service, they are good but not memorable, except for a few individuals, like Izan. 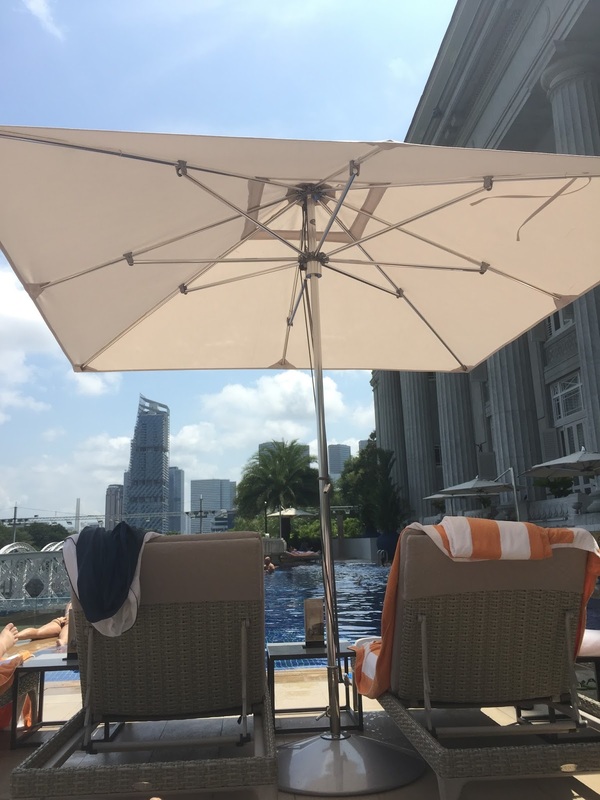 Located at the fringe of the central business district and next to Singapore River, Fullerton Hotel is a tad far from the main shopping district. Even the closest shopping mall, Marina Square area is a good 10 mins walk from the hotel. 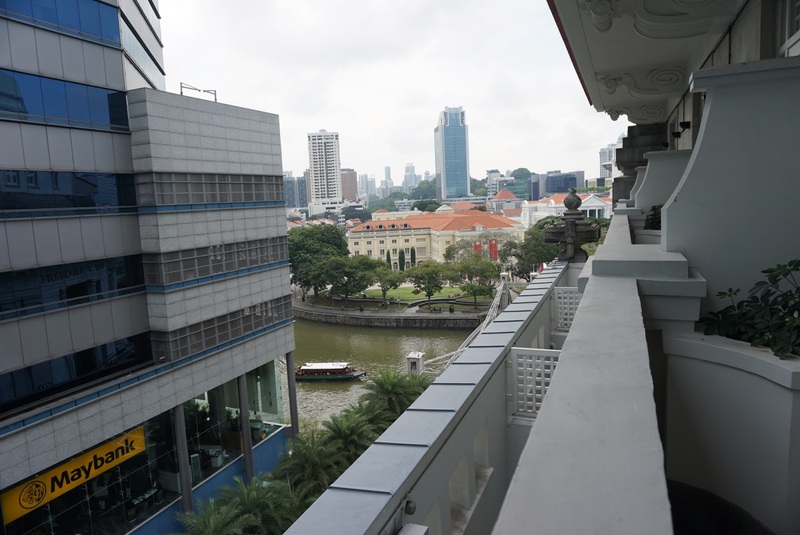 However the location of the hotel is a great spot to immense one with the history of Singapore, after all this hotel used to be the general post office of Singapore. It is also close to the iconic Merlion statue that many tourists come to visit. The area is rather quiet during weekends, but can busy during weekdays. 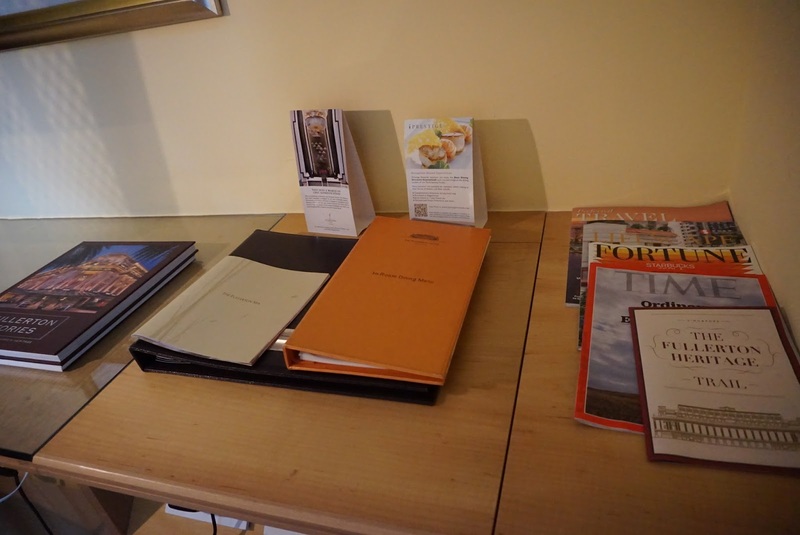 There are several museums around the vicinity of the hotel. I stayed in the Courtyard room. The naming of this room can be misleading. 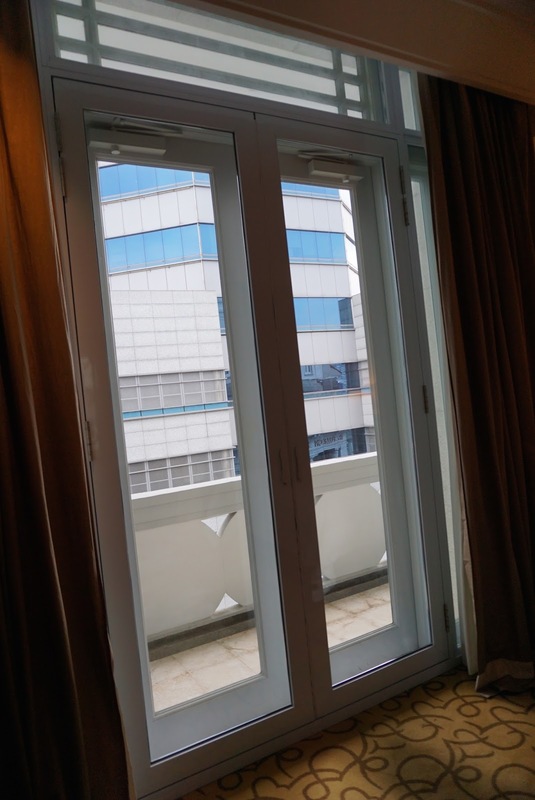 One might form the impression that the room comes with a outdoor patio for one to relax and just watch the life goes by, however the definition of “Courtyard” according to the hotel means the room is facing the interior of the hotel. 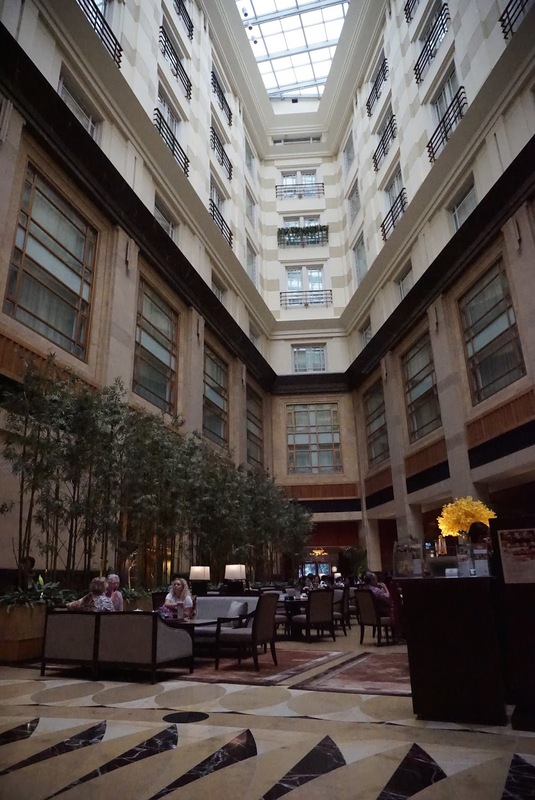 The ceiling to floor window allows guests to see what is happening inside the hotel. There are no views exterior of the hotel. The layout of the room is pretty standard as with most of the other hotels. 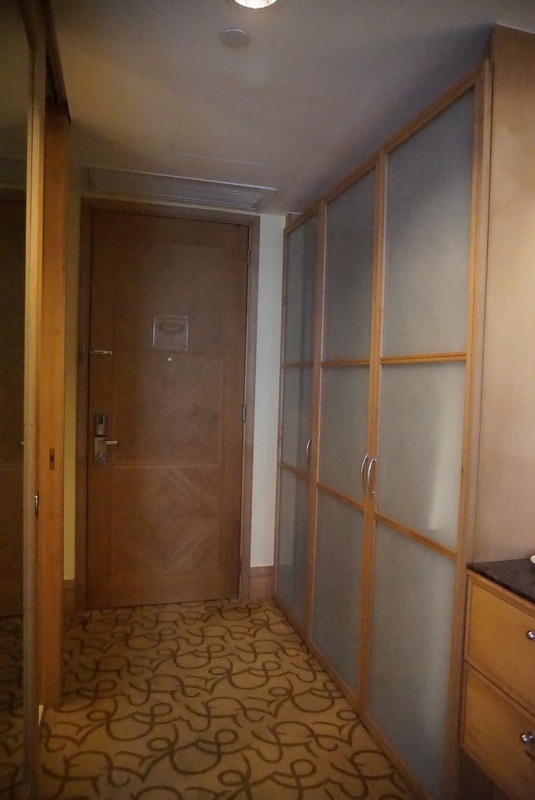 To the right of the main entrance of the room is the bathroom. Pasting the bathroom, one would find the main bedroom. The decor of the room feels classy and cozy. The King-sized bed in the room provided me with a very good night’s sleep. Coupled with the comfortable linen and duvet makes sleeping in this hotel heavenly. The powerful air con cooled down the room pretty quick given the hot weather in Singapore at this time of the year. There is also a single-seater armchair in the room for guests to rest should the do not wish to rest on the bed.Viewing the TV from the arm-chair is rather weird due to the angle it is placed relative to the TV. 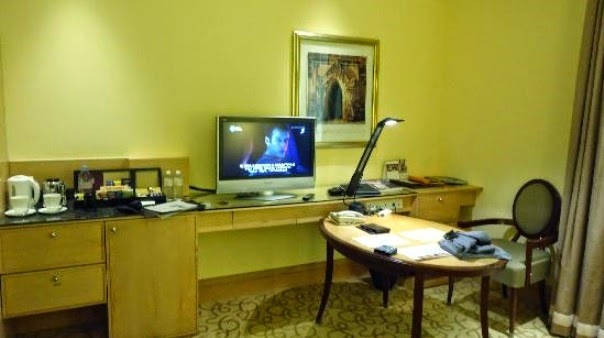 Opposite the bed, directly facing the main entrance is a small work desk and the TV. The study desk is a tad small which only allows a laptop to be placed. However there is a side table next to the study desk, which provides additional space. I find the orientation of the table odd as it is facing the main door and not the window. The TV is also almost immediately next to the study table, which makes viewing of the TV only possible from the bed or the armchair. 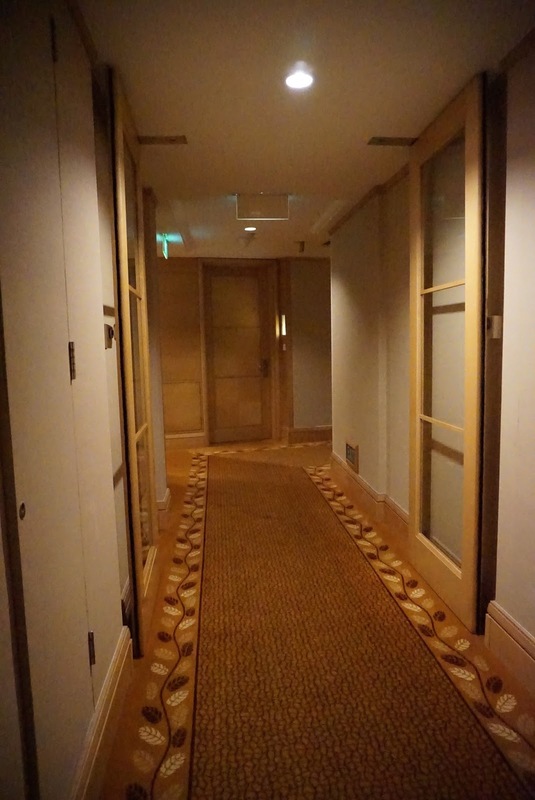 This area is where one would find the minibar and complementary coffee and tea. The hotel provides very quality coffee and tea. 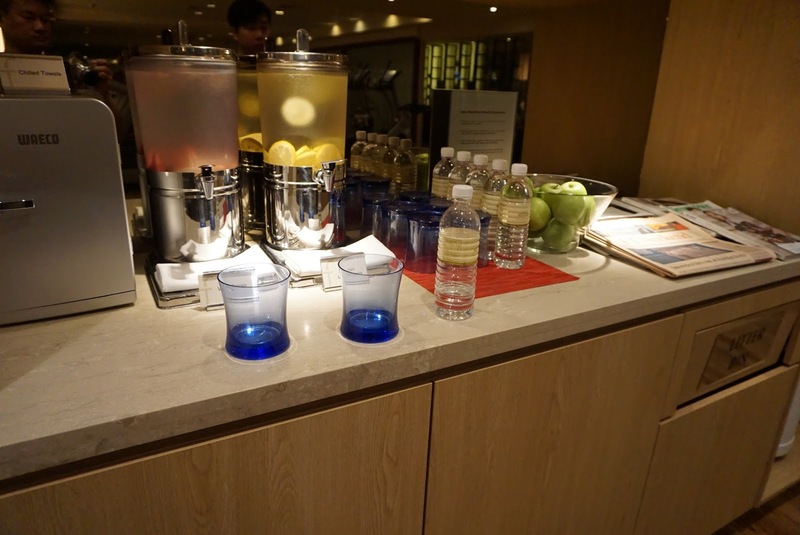 The hotel provides guests with the premium TWG tea. As mentioned previously bathroom is next to the main entrance of the room. The bath room is rather large for the category of the room. 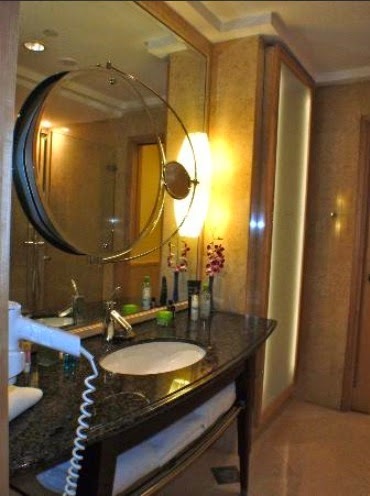 The large mirror at the sink, opposite the bathtub gives guests the feeling of spaciousness in the bathroom. 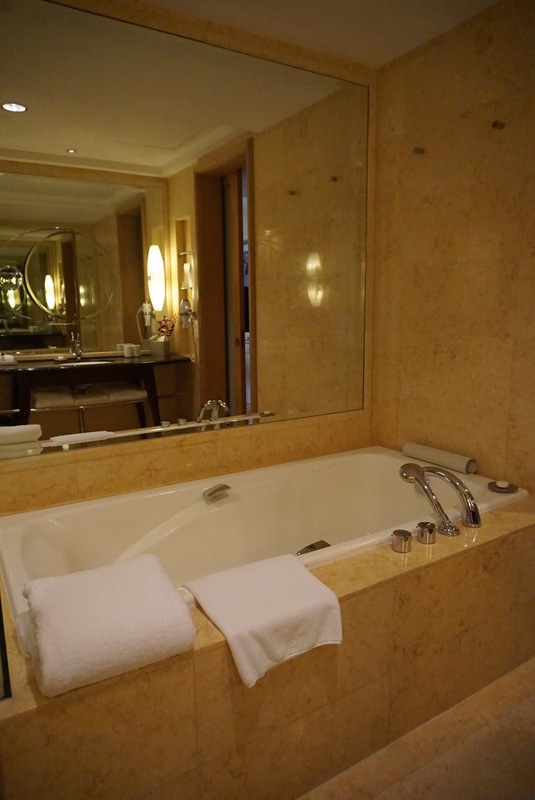 What I love about the bathroom is the huge bathtub, which allows one to soak in a relaxing bath without feeling squeeze. There are some storage shelving next to the sink. The walk in shower features rain shower, providing guests great showering quality. 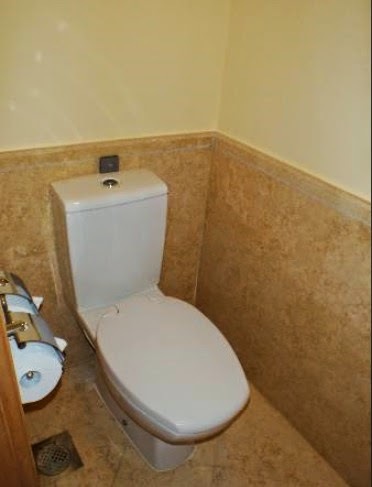 There is also a small room with toilet bowl inside. 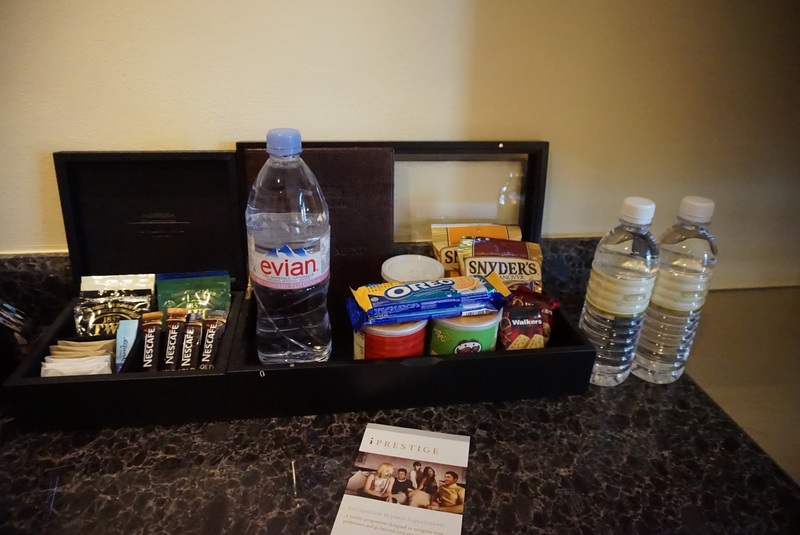 As a 5-star hotel, one would certainly expect exemplary service from Fullerton. The great service only stops at the check-in counter. As I booked this room for my birthday, the attentive clerk at the reception saw that it was my birthday on the day of checking in and wished me happy birthday. 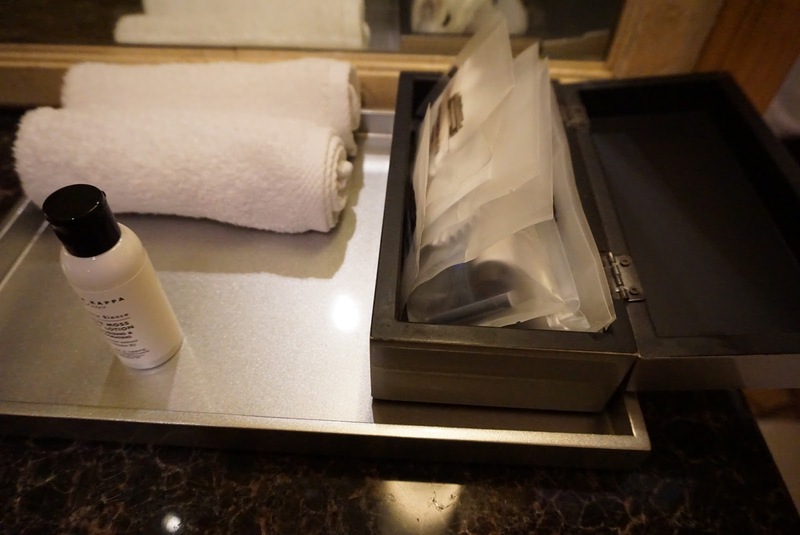 First impression of the hotel is the staff paid attention to details. However the great service stops there. My friend arranged with the hotel for a surprise birthday cake for me to be delivered in room by 5pm but the cake did not come until almost midnight when my birthday is almost over. My friend was puzzled and called the reception a few times enquiring about the cake, which certainly spoil the surprise that was installed for me. The reception kept mentioning that they will deliver it shortly. But it never came. We thought they will place the cake in the room during the turndown service. We left the hotel for dinner elsewhere. Upon returning, there is still no cake. My friend was truly embarrassed. My friend called the reception asking about the cake, this time round the reception claim ignorance of the arrangement of the cake. When questioned as to the reason the staff previously we spoke to acknowledged about the cake, the staff was dumbfounded and finally deliver the cake at around 11pm. This incident proved to us there is no sincerity in the service rendered by the hotel, certainly no befitting of 5-star. The horrendous service does not end there. The next day we headed for breakfast at the Town Restaurant. First impression, there are inconsistency in the layout of the table. I saw some tables stocked with 4 small jars of jam while some have none, some have less then 4. 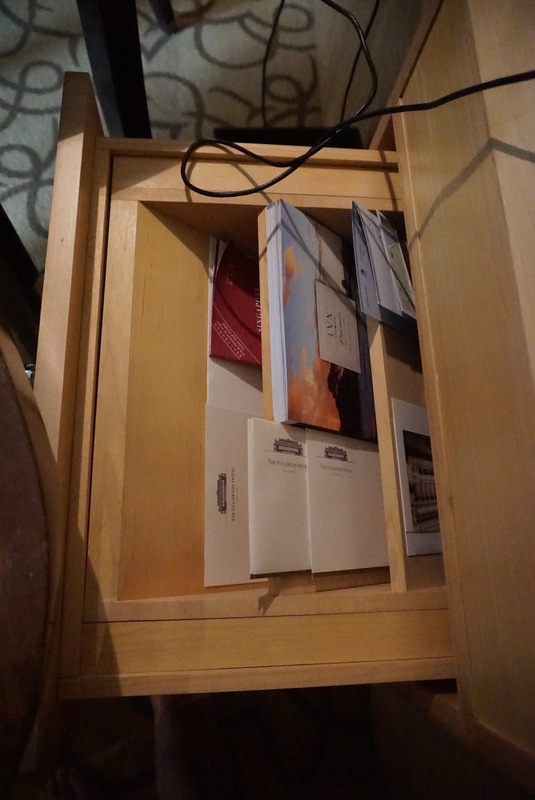 This proves to show that the hotel does not pay attention to details. What really pissed me off is the racial discriminatory service and I have experienced. I was at the egg station and the staff at the egg station gave me a very unfriendly look and asked very rudely “What you want??!!”. I was a little offended by the tone, but thinking she might be tired after a long morning’s work cooking eggs. We ordered what we wanted. As we were about to leave the egg station, the same staff, upon seeing a Caucasian approaching her,, greeted the guests with a million dollar smile and warmth, asking him “Good Morning Sir, How can I serve you the egg of your preference?” At this point I was very pissed off with such discriminatory service. To make matters worst, the staff at the egg station was discriminating against her fellow countrymen. I brought this up to the hotel subsequently and nothing was heard from them since. In terms of the hardware, the hotel got it. It provides good night rest for guests and the bathroom is impressive. However the service feels fake and insincere, when brought up to the management, nothing was done about it and no response heard from them. To make matters worst, it seem the hotel condoles discriminatory service and racism. Given the amount spent on the one-night stay, one will find somewhere better at a more convenient location, unless one do not mind being discriminated upon.